Francis Borgia, born 28 October, 1510, was the son of Juan Borgia, third Duke of Gandia, and of Juana of Aragon; died 30 September, 1572. The future saint was unhappy in his ancestry. His grandfather, Juan Borgia, the second son of Alexander VI, was assassinated in Rome on 14 June, 1497, by an unknown hand, which his family always believed to be that of Cæsar Borgia. Rodrigo Borgia, elected pope in 1402 under the name of Alexander VI, had eight children. The eldest, Pedro Luis, had acquired in 1485 the hereditary Duchy of Gandia in the Kingdom of Valencia, which, at his death, passed to his brother Juan, who had married Maria Enriquez de Luna. Having been left a widow by the murder of her husband, Maria Enriquez withdrew to her duchy and devoted herself piously to the education of her two children, Juan and Isabel. After the marriage of her son in 1509, she followed the example of her daughter, who had entered the convent of Poor Clares in Gandia, and it was through these two women that sanctity entered the Borgia family, and in the House of Gandia was begun the work of reparation which Francis Borgia was to crown. Great-grandson of Alexander VI, on the paternal side, he was, on his mother's side, the great-grandson of the Catholic King Ferdinand of Aragon. This monarch had procured the appointment of his natural son, Alfonso, to the Archbishopric of Saragossa at the age of nine years. By Anna de Gurrea, Alfonso had two sons, who succeeded him in his archiepiscopal see, and two daughters, one of whom, Juana, married Duke Juan of Gandia and became the mother of our saint. By this marriage Juan had three sons and four daughters. By a second, contracted in 1523, he had five sons and five daughters. The eldest of all and heir to the dukedom wasFrancis. Piously reared in a court which felt the influence of the two Poor Clares, the mother and sister of the reigning duke, Francis lost his own mother when he was but ten. In 1521, a sedition amongst the populace imperilled the child's life, and the position of the nobility. When the disturbance was suppressed, Francis was sent to Saragossa to continue his education at the court of his uncle, the archbishop, an ostentatious prelate who had never been consecrated nor even ordained priest. Although in this court the Spanish faith retained its fervour, it lapsed nevertheless into the inconsistencies permitted by the times, and Francis could not disguise from himself the relation in which his grandmother stood to the dead archbishop, although he was much indebted to her for his early religious training. While at Saragossa Francis cultivated his mind and attracted the attention of his relatives by his fervour. They being desirous of assuring the fortune of the heir of Gandia, sent him at the age of twelve toTordesillas as page to the Infanta Catarina, the youngest child and companion in solitude of the unfortunate queen, Juana the Mad. In 1525 the Infanta married King Juan III of Portugal, and Francis returned to Saragossa to complete his education. At last, in 1528, the court of Charles V was opened to him, and the most brilliant future awaited him. On the way to Valladolid, while passing, brilliantly escorted, through Alcalá de Henares, Francis encountered a poor man whom the servants of the Inquisition were leading to prison. It was Ignatius of Loyola. The young nobleman exchanged a glance of emotion with the prisoner, little dreaming that one day they should be united by the closest ties. The emperor and empress welcomed Borgia less as a subject than as a kinsman. He was seventeen, endowed with every charm, accompanied by a magnificent train of followers, and, after the emperor, his presence was the most gallant and knightly at court. In 1529, at the desire of the empress, Charles V gave him in marriage the hand of Eleanor de Castro, at the same time making him Marquess of Lombay, master of the hounds, and equerry to the empress, and appointing Eleanor Camarera Mayor. The newly-created Marquess of Lombay enjoyed a privileged station. Whenever the emperor was travelling or conducting a campaign, he confided to the young equerry the care of the empress, and on his return to Spain treated him as a confidant and friend. In 1535, Charles V led the expedition against Tunis unaccompanied by Borgia, but in the following year the favourite followed his sovereign on the unfortunate campaign in Provence. Besides thevirtues which made him the model of the court and the personal attractions which made him its ornament, the Marquess of Lombay possessed a cultivated musical taste. He delighted above all in ecclesiastical compositions, and these display a remarkable contrapuntal style and bear witness to the skill of the composer, justifying indeed the assertion that, in the sixteenth century and prior to Palestrina, Borgia was one of the chief restorers of sacred music. In 1538, at Toledo, an eighth child was born to the Marquess of Lombay, and on 1 May of the next year the Empress Isabella died. The equerry was commissioned to convey her remains to Granada, where they were interred on 17 May. The death of the empress caused the first break in the brilliant career of the Marquess and Marchioness of Lombay. It detached them from the court and taught the nobleman the vanity of life and of its grandeurs. Blessed John of Avila preached the funeral sermon, and Francis, having made known to him his desire of reforming his life, returned to Toledo resolved to become a perfect Christian. On 26 June, 1539, Charles V named Borgia Viceroy of Catalonia, and the importance of the charge tested the sterling qualities of the courtier. Precise instructions determined his course of action. He was to reform the administration of justice, put the finances in order, fortify the city of Barcelona, and repress outlawry. On his arrival at the viceregal city, on 23 August, he at once proceeded, with an energy which no opposition could daunt, to build the ramparts, rid the country of thebrigands who terrorized it, reform the monasteries, and develop learning. During his vice-regency he showed himself an inflexible justiciary, and above all an exemplary Christian. But a series of grievous trials were destined to develop in him the work of sanctification begun at Granada. In 1543 he became, by the death of his father, Duke of Gandia, and was named by the emperor master of the household of Prince Philip of Spain, who was betrothed to the Princess of Portugal. This appointment seemed to indicate Francis as the chief minister of the future reign, but by God's permission the sovereigns of Portugal opposed the appointment. Francis then retired to his Duchy of Gandia, and for three years awaited the termination of the displeasure which barred him from court. He profited by this leisure to reorganize his duchy, to found a university in which he himself took the degree of Doctor of Theology, and to attain to a still higher degree of virtue. In 1546 his wife died. The duke had invited the Jesuits to Gandia and become their protector and disciple, and even at that time their model. But he desired still more, and on 1 February, 1548, became one of them by the pronunciation of thesolemn vows of religion, although authorized by the pope to remain in the world, until he should have fulfilled his obligations towards his children and his estates—his obligations as father and as ruler. In December, 1556, and three other times, Charles V shut himself up at Yuste. He at once summoned thither his old favourite, whose example had done so much to inspire him with the desire to abdicate. In the following month of August, he sent him to Lisbon to deal with various questions concerning the succession of Juan III. When the emperor died, 21 September, 1558, Borgia was unable to be present at his bedside, but he was one of the testamentary executors appointed by the monarch, and it was he who, at the solemn services at Valladolid, pronounced the eulogy of the deceased sovereign. A trial was to close this period of success. In 1559 Philip II returned to reign in Spain. Prejudiced for various reasons (and his prejudice was fomented by many who were envious of Borgia, some of whose interpolated works had been recently condemned by the Inquisition), Philip seemed to have forgotten his old friendship for the Marquess of Lombay, and he manifested towards him a displeasure which increased when he learned that the saint had gone to Lisbon. Indifferent to this storm, Francis continued for two years in Portugal his preaching and his foundations, and then, at the request of Pope Pius IV, went to Rome in 1561. But storms have their providential mission. It may be questioned whether but for the disgrace of 1543 the Duke of Gandia would have become a religious, and whether, but for the trial which took him away from Spain, he would have accomplished the work which awaited him in Italy. At Rome it was not long before he won the veneration of the public. Cardinals Otho Truchsess, Archbishop of Augsburg, Stanislaus Hosius, and Alexander Farnese evinced towards him a sincere friendship. Two men above all rejoiced at his coming. They were Michael Chisleri, the future Pope Pius V, and Charles Borromeo, whom Borgia'a example aided to become a saint. On 16 February, 1564, Francis Borgia was named assistant general in Spain and Portugal, and on 20 January, 1565, was elected vicar-general of the Society of Jesus. He was elected general 2 July, 1565, by thirty-one votes out of thirty-nine, to succeed Father James Laynez. Although much weakened by his austerities, worn by attacks of gout and an affection of the stomach, the new general still possessed much strength, which, added to his abundant store of initiative, his daring in the conception andexecution of vast designs, and the influence which he exercised over the Christian princes and at Rome, made him for the Society at once the exemplary model and the providential head. In Spain he had had other cares in addition to those of government. Henceforth he was to be only the general. The preacher was silent. The director of souls ceased to exercise his activity, except through his correspondence, which, it is true, was immense and which carried throughout the entire world light and strength to kings, bishops and apostles, to nearly all who in his day served the Catholic cause. His chief anxiety being to strengthen and develop his order, he sent visitors to all the provinces of Europe, to Brazil, India, and Japan. The instructions, with which he furnished them were models of prudence, kindness, and breadth of mind. For the missionaries as well as for the fathers delegated by the pope to the Diet of Augsburg, for the confessors of princes and the professors of colleges he mapped out wide and secure paths. While too much a man of duty to permit relaxation or abuse, he attracted chiefly by his kindness, and won souls to good by his example. The edition of the rules, at which he laboured incessantly, was completed in 1567. He published them at Rome, dispatched them (throughout the Society), and strongly urged their observance. The text of those now in force was edited after his death, in 1580, but it differs little from that issued by Borgia, to whom the Society owes the chief edition of its rules as well as that of the Spiritual, of which he had borne the expense in 1548. In order to ensure the spiritual and intellectual formation of the young religious and the apostolic character of the whole order, it became necessary to take other measures. The task of Borgia was to establish, first at Rome, then in all the provinces, wisely regulated novitiates and flourishing houses of study, and to develop the cultivation of the interior life by establishing in all of these the custom of a daily hour of prayer. He completed at Rome the house and church of S. Andrea in Quirinale, in 1567. Illustrious novices flocked thither, among them Stanislaus Kostka (d. 1568), and the future martyr Rudolph Acquaviva. Since his first journey to Rome, Borgia had been preoccupied with the idea of founding a Roman college, and while in Spain had generously supported the project. In 1567, he built the church of the college, assured it even then an income of six thousand ducats, and at the same time drew up the rule of studies, which, in 1583, inspired the compilers of the Ratio Studiorum of the Society. Being a man of prayer as well as of action, the saintly general, despite overwhelming occupations, did not permit his soul to be distracted from continual contemplation. Strengthened by so vigilant and holy an administration the Society could not but develop. Spain and Portugal numbered many foundations; in Italy Borgia created the Roman province, and founded several colleges in Piedmont. France and the Northern province, however, were the chief field of his triumphs. His relations with the Cardinal de Lorraine and his influence with the French Court made it possible for him to put an end to numerous misunderstandings, to secure the revocation of several hostile edicts, and to found eight colleges in France. In Flanders and Bohemia, in the Tyrol and in Germany, he maintained and multiplied important foundations. The province of Poland was entirely his work. At Rome everything was transformed under his hands. He had built S. Andrea and the church of the Roman college. He assisted agenerously in the building of the Gesù, and although the official founder of that church was Cardinal Farnese, and the Roman College has taken the name of one of its greatest benefactors, Gregory XIII, Borgia contributed more than anyone towards these foundations. During the seven years of his government, Borgia had introduced so manyreforms into his order as to deserve to be called its second founder. Three saints of this epoch laboured incessantly to further the renaissance of Catholicism. They were St. Francis Borgia, St. Pius V, and St. Charles Borromeo. On 7 June, 1571, Pius V requested him to accompany his nephew, Cardinal Bonelli, on an embassy to Spain and Portugal. Francis was then recovering from a severe illness; it was feared that he had not the strength to bear fatigue, and he himself felt that such a journey would cost him his life, but he gave it generously. Spain welcomed him with transports. The old distrust of Philip II was forgotten. Barcelona and Valencia hastened to meet their former viceroy and saintly duke. The crowds in the streets cried: "Where is the saint?" They found him emaciated by penance. Wherever he went, he reconciled differences and soothed discord. At Madrid, Philip II received him with open arms, the Inquisition approved and recommended his genuine works. The reparation was complete, and it seemed as though God wished by this journey to give Spain to understand for the last time this living sermon, the sight of a saint. Gandia ardently desired to behold its holy duke, but he would never consent to return thither. The embassy to Lisbon was no less consoling to Borgia. Among other happy results he prevailed upon the king, Don Sebastian, to ask in marriage the hand of Marguerite of Valois, the sister of Charles IX. This was the desire of St. Pius V, but this project, being formulated too late, was frustrated by the Queen of Navarre, who had meanwhile secured the hand of Marguerite for her son. An order from the pope expressed his wish that the embassy should also reach the French court. The winter promised to be severe and was destined to prove fatal to Borgia. Still more grievous to him was to be the spectacle of the devastation which heresy had caused in that country, and which struck sorrow to the heart of the saint. At Blois, Charles IX and Catherine de' Medici accorded Borgia the reception due to a Spanish grandee, but to the cardinal legate as well as to him they gave only fair words in which there was little sincerity. On 25 February they left Blois. By the time they reached Lyons, Borgia's lungs were already affected. Under these conditions the passage of Mt. Cenis over snow-covered roads was extremely painful. By exerting all his strength the invalid reached Turin. On the way the people came out of the villages crying: "We wish to see the saint". Advised of his cousin's condition, Alfonso of Este, Duke of Ferrara, sent to Alexandria and had him brought to his ducal city, where he remained from 19 April until 3 September. His recovery was despaired of and it was said that he would not survive the autumn. Wishing to die either atLoretto or at Rome, he departed in a litter on 3 September, spent eight days at Loretto, and then, despite the sufferings caused by the slightest jolt, ordered the bearers to push forward with the utmost speed for Rome. It was expected that any instant might see the end of his agony. They reached the "Porta del Popolo" on 28 September. The dying man halted his litter and thanked God that he had been able to accomplish this act of obedience. He was borne to his cell which was soon invaded by cardinals and prelates. For two days Francis Borgia, fully conscious, awaited death, receiving those who visited him and blessing through his younger brother, Thomas Borgia, all his children and grandchildren. Shortly after midnight on 30 September, his beautiful life came to a peaceful and painless close. 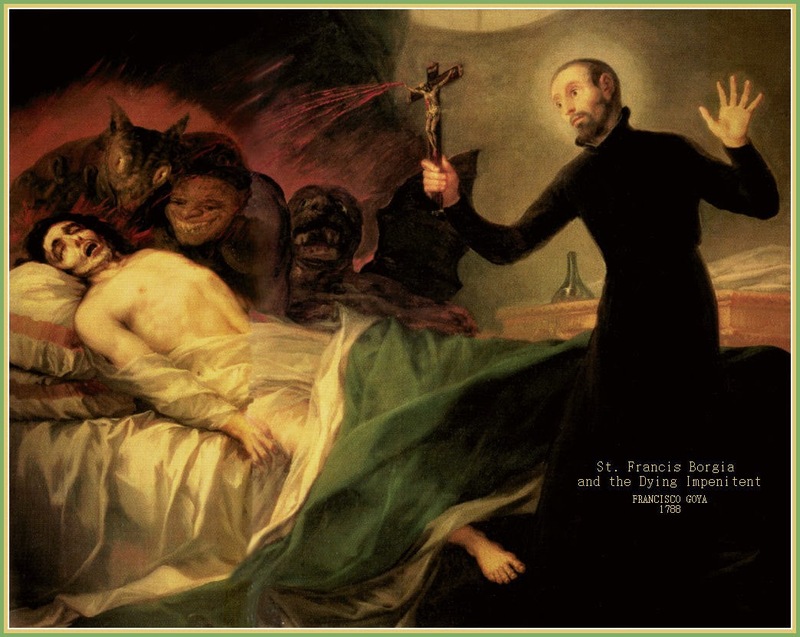 In the Catholic Church he had been one of the most striking examples of the conversion of souls after the Renaissance, and for the Society of Jesus he had been the protector chosen by Providence to whom, after St. Ignatius, it owes most.